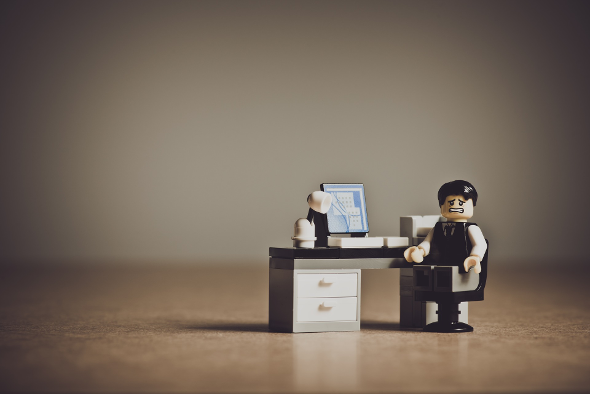 With all the recreational road rides and mountain bike rides that I do and write about, you probably all think that a vast media empire like this blog affords me a life of luxury and frivolity at the level that Murdoch or Packer might enjoy. Sadly, that’s just not true. There’s work to be done, groceries to be gotten and errands to run if I want to be able to pay for my web hosting, my bicycles and keep food on my table. 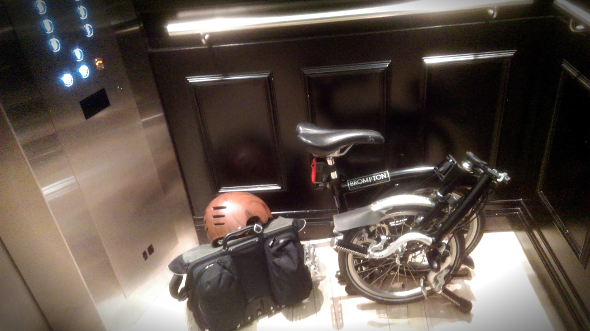 While the Brompton is great for getting to work and picking up a few odds and ends from the supermarket that I may have forgotten, when I need to do a full week’s shopping, I need a bit more room to carry everything and that’s where my Cannondale shopping/cargo bike conversion comes in with its voluminous pannier bags and trailer. 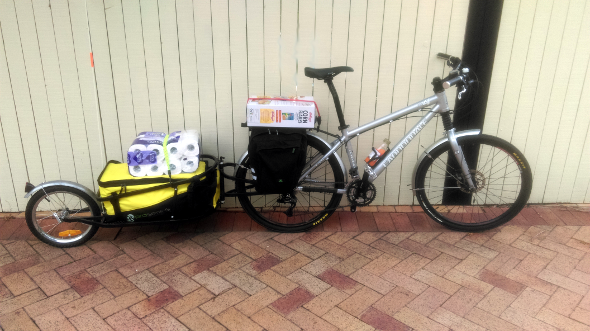 As I’ve mentioned before, this setup is a great, low cost way of transitioning to cargo biking and it has served me brilliantly for about two years now. So, if you’re teetering on the knife edge of indecision about whether or not to spend money on trying out something like this, let me tip you over to the yes side because if you already have an old bike lying around, you can get a set of pannier bags from about $30 and that trailer was a poultry $239.00 when I bought it. And speaking of things that aren’t financially burdensome, a recent stroke of good luck has resulted in my being able to ride in the Tour de Brisbane held on Sunday 14th April 2019 for the delightful price of…nothing. Why? 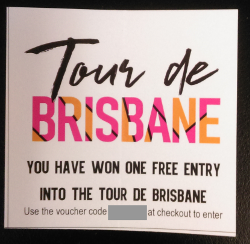 Because after a recent appointment I attended in our great CBD, while sauntering down the Queen Street Mall, I came upon a stall set up by the good folks running the Tour de Brisbane and Brisbane Bicycle Festival, entered their lucky dip and, presto! – one free entry for yours truly. I also partook in their 500 metre stationery road bike on rollers dash for an even loftier prize (a year’s membership to Cycling Queensland) but my decrepitude failed me on that one. If you’re interested in entering the Tour de Brisbane yourself, you’re cutting it pretty fine but I believe you can still do a late entry if you hurry. “If we’ve been known for anything in the last decade it’s been for delivering road infrastructure but we’ve seen across the world that it’s impossible to outbuild congestion,” he said. “This new generation of leadership in City Hall sees that we must move our building program towards public and active transport infrastructure. At last, some politicians I can agree with. Let’s hope it actually all comes to fruition though early indicators from Bicycle Queensland say they’re going to make good on their statements. I guess only time will tell. And from revolutionary, ground breaking change that’s almost too good to put into words to one of the reasons why we need those kinds of paradigm shifts in public policy. I know this has done the rounds on the interwebs quite a bit over the last little while but I thought it worth another mention. As far as I can see, what leads people to espousing these kinds of attitudes is partly that they’re genuinely convinced that the roads should be for the exclusive and uninterrupted use of motorists and that everyone traveling anywhere should do so by car as a matter of common sense and decency. Such utterly nonsensical thinking is probably a result of decades of marketing and propaganda by various relevant corporations and government policies designed to make driving seem as indispensable as possible. So entrenched are those attitudes that the people espousing them are completely blinkered to facts such as that registration and fuel excise does not cover the cost of driving and that there is simply not enough space in our cities for the number of cars that people believe they have to to drive in them. I think there’s probably also a subset who know in their rational minds that the facts against driving are true and that it’s not possible to continue driving in cities into the future the way we do but who are so conceited and selfish that, even as perfectly able bodied people, simply can’t stand the thought of relinquishing their car for anything that is, in their wrongful perception, any less convenient or prestigious. So, I think at least part of the attitudes come from a sense of feeling threatened about losing the privilege of being able to drive (in every legal and ethical sense, driving is a privilege not a right). Sort of like spoilt children having their lollies taken away. 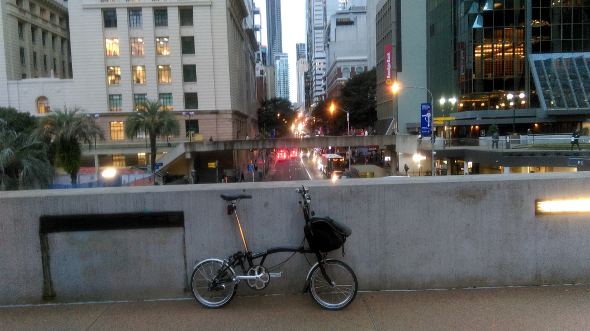 Lastly, I’d like to report that, as stated, I attended the 2019 installment of the Brisbane Bicycle Film Festival and, as in previous years, it was a roaring success. So much so that they had to hire a larger cinema to show the feature film, Bikes of Wrath. I look forward, as always, to next year’s BBFF. If you ride a bicycle and think you’re not making a political statement, think again.